As divers, we spend a lot in the ocean, around the ocean, and talking about the ocean. Like all people who depend upon the ocean for life, sport, or entertainment, we are affected by conditions that are, for the most part, out of our hands. Shore diving, which is hugely popular in Southern California, is largely dependent on small waves for safe entries and exits. When teaching open water classes, or any classes that will have a shore entry as part of the curriculum, my eye and mind is on the surf report, from the moment the class starts, until the moment my students are walking out of the water, gear in place, and safe. Waves are made with the following recipe: water and wind, and water and land. Basically, wind drags over the surface of the water, (this wind is energy), and the transfer of energy into the water causes movement. It may look like the whole ocean is moving, but the movement is actually just the top part of the ocean. The stagnant water underneath the waves causes an oscillation. This rotation of the liquid forces the wave forward and the energy that moves through the water-causing waves is orbital…meaning the water molecules in a wave are making a circle. breaking waves….not ideal for diving. But can you spot the circular motion? Waves break when the base can no longer support the weight of the water. In shallow water, waves break when the height of the wave is .8 times the depth, or when the wind is strong enough to force the crash. Going through breaking waves is difficult in scuba gear, when one is top heavy, and hindered by drag. Therefore, walking through breaking waves must be timed to coincide with lulls in the breaks, and of course, only when the waves are not breaking big at all. Here are different kinds of breaking waves, if you’re interested. Because waves break in different ways, depending on different conditions. In the open ocean, the wind may be blowing really hard. This may force other waves to join up and get bigger and faster (this is called constructive interference)….creating a swell. You can see swells all over the ocean right now at this website, which is a site I check regularly for conditions. 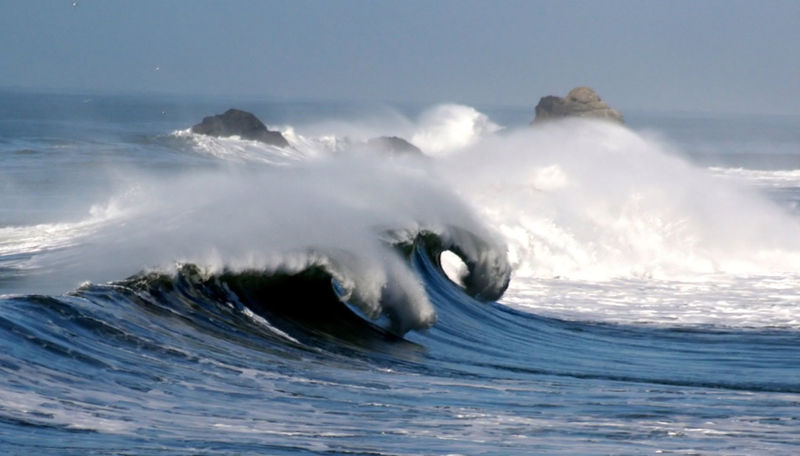 “Swells are defined as mature undulations of water in the open ocean after wave energy has left the wave generating region.” (cited from here) Swells are patterns in an area that are big enough that we can watch and kind of figure out what’s coming our way. They can be measured by the direction they are coming. So you might hear: there is a really big south swell coming this weekend!. If the beach is facing that direction, then it’s going to be pounded by that swell, once it arrives. If there is a large swell, diving is out of the question. Not only will shore entries and exits be difficult if not impossible, but the visibility is usually marred by the sand being churned up and thrown in the faces of every organism under the sea. And that is the what of the waves.